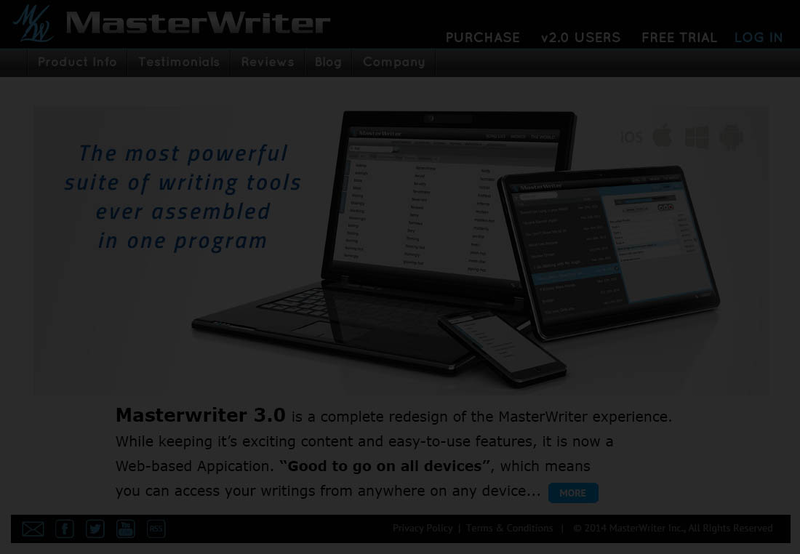 MasterWriter is web-based so you will need to create an account to access the program. Your email address will be your username and you will need to create a password. There is an existing account with this email address. Do you have an existing 3.0 account? for a Free Trial or Licensed MasterWriter 3.0. IMPORTANT NOTE: This software is licensed to you only for reproduction of non-copyrighted materials, materials in which you own the copyright, or materials you are authorized or legally permitted to reproduce. If you are uncertain about your right to copy any material you should contact your legal advisor. THIS END USER SOFTWARE LICENSE AGREEMENT (the "Agreement") is made between you, the end user, (hereafter the Licensee), and MasterWriter Inc., a California corporation, (hereafter MasterWriter). 1. Grant of License: The Software is being licensed, not sold, to you, by MasterWriter. MasterWriter hereby grants the Licensee a non-exclusive, non-transferable license to use the MasterWriter(tm) software and all accompanying documentation, fonts and plug-ins, under the terms of this license. 2. Intellectual Property: The Software, including its operation, code, architecture and implementation, as well as the look and feel of the Software are the valuable intellectual property of MasterWriter. You may not rent, lease, loan, distribute, resell for profit or modify or create derivative works based upon the software in whole or in part. The Software is protected by United States copyright laws and international treaty provisions. This Agreement does not give you any intellectual property rights in the Software. You may not modify, translate, disassemble, decompile, reverse engineer, create derivative works of, or make any other attempt by any means to discover or obtain the source code for the Software. 3. Disclaimer of Warranty: The software and documentation are provided "as is" and without warranty of any kind. MasterWriter Inc. does not guarantee that the software will meet Licensee's requirements or that the operation of the software will be error free or that defects in the software will be corrected. MasterWriter does not guarantee the results of the use of the software or its documentation in terms of their accuracy, correctness, reliability or otherwise. No written or oral information or advice given by MasterWriter or its authorized representatives shall create a warranty or increase the scope of this warranty. 4. Limitation of Liability: To the maximum extent permitted under applicable laws, under no circumstances, including negligence, shall MasterWriter Inc., or their Partners, Directors, Officers, Employees, Agents be liable for any incidental, special or consequential damages (including damages for loss of business profits, business interruption, loss of business Information and the like) arising out of the use or inability to use the software or its documentation, even if MasterWriter or its authorized representative has been advised of the possibility of such damages. In no event shall MasterWriter Inc.'s total liability to Licensee for all damages, losses, and causes of action exceed the amount paid by Licensee for the Software and its documentation. 5. Termination: This license shall remain in effect until terminated. Failure to abide by the terms of the Software License will result in immediate termination of the Software License. 6. Export Law Assurances: The Licensee agrees and certifies that neither the software nor any technical data received from MasterWriter Inc. will be exported outside the United States except as permitted by MasterWriter Inc..
7. Government End Users: The SOFTWARE and documentation is provided with RESTRICTED RIGHTS. Use, duplication, or disclosure by the Government is subject to restrictions as set forth in subdivision (b)(3)(ii) of The Rights in Technical Data and Computer Software clause at 252.227-7013. 8. Controlling Law and Severability: This License shall be governed by and construed in accordance with the laws of the United States and the State of California, as applied to agreements entered into and to be performed entirely within California between California residents. This License shall not be governed by the United Nations Convention on Contracts for the International Sale of Goods, the application of which is expressly excluded. If for any reason a court of competent jurisdiction finds any provision of this License, or portion thereof, to be unenforceable, that provision of the License shall be enforced to the maximum extent permissible so as to effect the intent of the parties, and the remainder of this License shall continue in full force and effect. 9. Entire Agreement: This License constitutes the entire agreement between MasterWriter Inc. and the Licensee with respect to the use of the Software and it's documentation, and supersedes all prior or contemporaneous understandings or agreements, written or oral, regarding such subject matter. 10. Copyrights and Trademarks: The MasterWriter®, Songuard® and SOUND-ALIKES® logos are trademarks of MasterWriter Inc. in the United States and other countries. MasterWriter® © 2002-2014 MasterWriter Inc. All Rights reserved. US Patent #7277883 and additional patent pending. Use of this product is subject to the acceptance of the License Agreement and Limited Warranty displayed during program installation. The American Heritage Dictionary of the English Language Fourth Edition published by Houghton Mifflin Harcourt Publishing company. Copyright © 2007, 2000 by Houghton Mifflin Harcourt Publishing Company. Updated in 2009. All right reserved. The Synonym Finder is published by Rodale Press Inc., © 1978. All rights reserved. All trademarks other than MasterWriter®, Songuard® and SOUND-ALIKES® are the properties of their respective owners. All text in Rhymes, Rhymes Sound-Alikes, Rhymed-Phrases, Rhymed-Phrases Sound-Alikes, Phrases, Alliterations and Pop-Culture Text __copyright 2003-2013 Texicon Inc. All Rights Reserved.